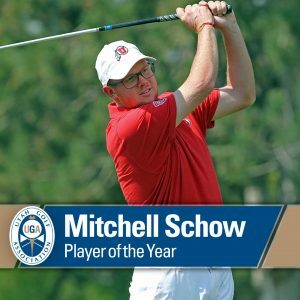 Mitchell Schow’s T-shirt and fishing cap probably won’t be collectible items displayed in the Utah Golf Hall of Fame, but those artifacts are part of the story of how he became the 2018 UGA Player of the Year. The University of Utah golfer from Park City High School chose that attire for the Richard C. Kramer Salt Lake City Amateur in June as way to emphasize just having fun on the golf course. The strategy worked in his third amateur victory of the season, as he shot 69-69 to beat Ute teammate Kyler Dunkle by two strokes at Bonneville Golf Course. Schow already had won the Sand Hollow Amateur, posting 67-68 to top Utah teammate Blake Tomlinson by three shots, and tied for first in the Bountiful Amateur. Although he was upset in the first round of match play in the State Amateur, some other high finishes carried Schow to No. 1 in the Player Performance Rating, ahead of David Jennings and Dan Horner, and made him Player of the Year. Schow said after the Salt Lake City Am that he succeeded in trying to take golf less seriously, outside of the college schedule. Yet lessons he learned from his Ute coaches about using a pre-shot routine and applying course-management techniques helped him in amateur events.